I don’t know when I first fell in love with the upright bass as a jazz instrument. Probably I can blame Ray Brown since the Oscar Peterson Trio, particularly its early incarnations, was the ensemble that cemented my attraction to jazz. Ray forced the audience to pay attention to the bass solo, not an easy task in most venues. For some reason, perhaps the lower tone and less obvious translation of melody, many otherwise attentive listeners seem to regard the bass solo as the “intermission” portion of the performance. It’s these very qualities, however, that make the bass one of the most intriguing instruments of the ensemble. In his terrific jazz primer (What Jazz Is), New York pianist Jonny King wrote,“What a misunderstood instrument the acoustic bass is. It is large and physically impressive, and booms with the lowest of sounds and greatest of rumbles. Yet it is also a fragile piece of wooden sculpture that resonates in the background of the musical conscience of most listeners.” Misunderstood and typically in the background, the bass often goes more or less unnoticed by the average listener, yet ask musicians if the bass is all that important. “The bass is literally the pulse of any jazz band… as crucial to the sound of jazz as any other single element,” King reminds his readers. Aside from Ray Brown, whom I saw three times, I’ve heard some of the best of the modern era, from Dave Holland to Gary Peacock to Buster Williams to Christian McBride. McCoy Tyner always travels with an A-Team bassist, and on a recent Tyner trio gig at the Dakota, Charnett Moffett unleashed a ten-minute solo in which he used every conceivable means of coaxing sound from an acoustic wood chamber. Or so I thought at the time. The first work of the thirty-minute set was indeed an acoustic solo, no less interesting without the power chord and giving us a baseline from which to appreciate how electronic gadgetry can enhance acoustic elements. As Chris moved into the next piece, however, a sequence of high tech ideas began to flow, as he bowed a segment, then through electronic playback used it as a vamp of undertones to accompany his next exploration—in this case the use of a suction cup to create a shower of static. And so followed each new improvisation, a long bowed melody, playback of tone poems and sound effects, even seemingly incorporating a distant squeaking door hinge as if it was an intended element. Through it all, using melodic plucks, bowed chords, and the squeals, slides and growls of glissando, Chris tangoed and caressed his instrument, at times conjuring a wrestler holding a hostage in a half-nelson, at other times slapping the wood like a conguero. On one of the final pieces his sliding left hand created multi-string glissando, on another he created his own polyphonic quartet with three simultaneous loops comping the master. The effect was hypnotic. It’s hard to imagine anyone tuning out this soloist. Yet this was just round one at The Rogue Buddha, as Bates’ set was followed by an equally compelling group of free association masters, the Poutums Trio + 1 (tenorman Chris Thomson, bassist Adam Linz, drummer Alden Ikeda plus trumpeter Jon Pemberton). My focus still on the acoustic bass, I knew from past experience that Adam Linz (of Fat Kid Wednesdays and Gloryland Ponycat fame) possesses one of the widest musical palettes in local music, and he pulled out the doublestops with abandon. Using no electronic effects, he nevertheless created the illusion of techno manipulations, building multiple pathways to reverberation—mashing two strings against each other with his right hand; turning glissando upside-down by sliding his right hand up and down the strings beneath the neck, sending echoes into the air—an acoustic loop of sorts. And throughout it all, Adam made the bass dance—literally as he twirled and dipped his instrument to match his sonic choreography. 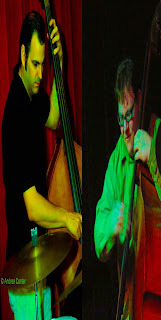 Chris and Adam might make the bass seem like the most hip instrument in jazz, but they manage to do so while also reminding us that the bass indeed has a melodic soul. Chris will be at the Artists Quarter twice next week, with How Birds Work (December 28th) and Red Planet (December 28-29). Watch for Adam with Fat Kid Wednesdays… or any other opportunity. Maybe it’s a long reach back to Ray Brown. Maybe not. Jonny King, What Jazz Is: An Insider’s Guide to Understanding and Listening to Jazz (1997, Walker & Co) is still in print. Above photo composite is a photographic version of looping (Chris on the left, Adam on the right).